Father Politics, like Mother Nature, abhors a vacuum. And so it was, even before the US Treasury announced its newest sanctions against Russian individuals and their companies for “malign activity around the globe”, that President-elect Vladimir Putin was preparing a successor cabinet of ministers on the principle that they would be organized as a headquarters staff for fighting a war on all fronts, without the option of negotiating terms with the enemy. The impact of the US sanctions, along with the campaign of the British Government in the Skripal affair, and the Syrian front action escalating since the weekend, have reinforced what had already been decided in the Kremlin. The new government is to be a war cabinet. In Russian parlance, a Stavka. To foreigners, Putin’s new war cabinet will look like the Stavka created by Joseph Stalin following the German invasion on June 21, 1941. In fact, the Stavka was a 19th century improvisation in Russian command-control methods. It has been the response of the military and security commands, and the intelligence services, when the head of state proves to be too mistaken, vacillating or indecisive to defend against foreign attacks aiming at the decapitation of Russia’s leadership, liquidation of its defences, and destruction of its economy. For details, click. The pictures issued by the Kremlin since last Friday reveal that Putin has decided, along with the Defense Ministry , the General Staff, the heads of the security services, and the Russian military-industrial complex, that he must change prime ministers. This means the revival of the candidacy of the Mayor of Moscow, Sergei Sobyanin. Putin will announce the new government after his official inauguration, which is legally appointed for May 7. Sobyanin, who turns 60 in June, was Putin’s choice to be his chief of staff in the Kremlin between 2005 and 2008. When Putin moved to the prime ministry in May 2008, Sobyanin moved with him to become the head of the government staff. He became Mayor of Moscow, replacing presidential contender Yury Luzhkov, on October 21, 2010. 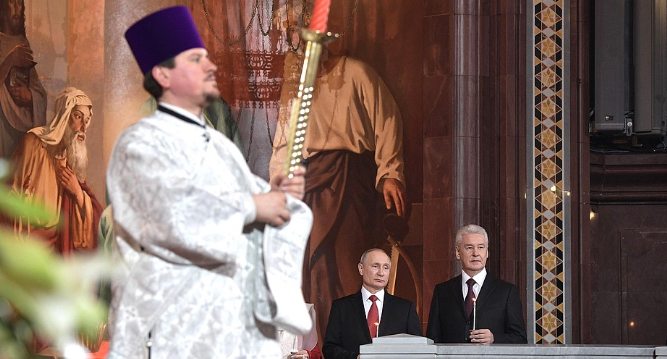 Sobyanin is Putin’s compromise with Russia’s military and security commanders who regard Medvedev as a capitulationist; and who have been losing confidence in the Kremlin’s capacity to withstand the escalating Anglo-American attacks. Instead of Medvedev, they may have preferred Sergei Shoigu, the Defense Minister, or Dmitry Rogozin, the deputy prime minister in charge of the military-industrial complex. Both of them Putin regards as presidential candidates with independent voices of their own, and thus threatening to his own supremacy. 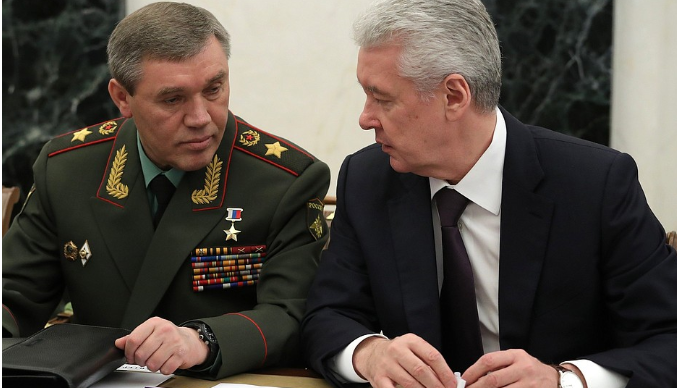 Sobyanin is a staff man, Putin calculates – not more. 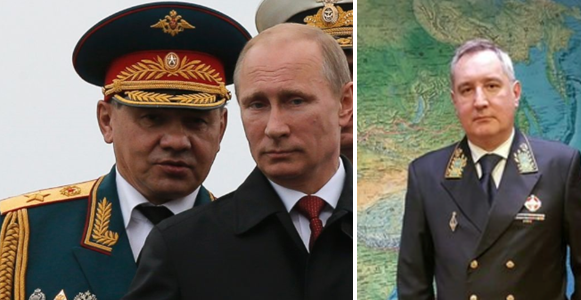 Left to right: Sergei Shoigu; Vladimir Putin; Dmitry Rogozin. For more on what they now stand for, read this. The uniforms Shoigu and Rogozin are wearing come with their Defense Ministry posts; by professional training they are civilians. Rogozin was proscribed in the first round of US sanctions in March 2014; Shoigu has not yet been sanctioned; nor has Sobyanin. There were enough dutiful qualifiers in these remarks to suspend the gossip without diminishing the reason for it. The intensification of the Anglo-American warfare since the presidential election on March 18 has reinforced the reason; also it has diminished Putin’s resistance to changing Medvedev. The source anticipates there will be fewer seats at the new cabinet table, consolidation of functions, streamlining of operations. The new minister of the economy, the source believes, may combine the industry portfolio, and represent a promotion for Denis Manturov, whose career started in the aviation section of Russia’s military industry; he has been minister of industry and trade since 2012. The source says the candidates for the Finance Ministry and the Central Bank “could be anyone. For example, [Tatiana] Golikova. These posts will matter less anyway.” Golikova has headed the state spending watchdog, the Accounting Chamber , since 2013; before that she was Minister of Health between 2007 and 2012. She is the wife of the Yeltsin-era industry minister, Victor Khristenko. Left to right: Denis Manturov; Tatiana Golikova; Igor Shuvalov. The Stavka approach is endorsed by several sources, although they aren’t telling their non-Russian friends, and Sobyanin’s name is not being mentioned. Medvedev’s reappointment, which appeared two months ago to be the likely result of Putin’s cabinet reshuffle, is unmentionable now. 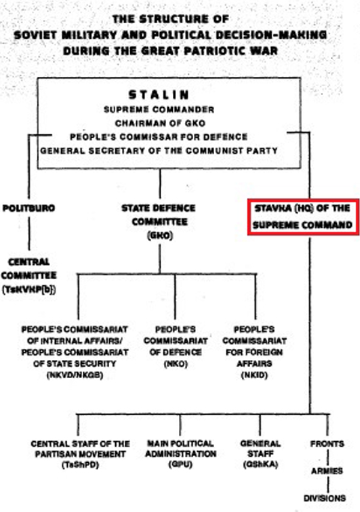 The Stavka approach also means the removal from active staff and line command roles of those individuals who have depended on Medvedev’s patronage; contributed to his presidential campaigns; and preserved the option of a Kremlin succession on terms to be negotiated with Washington, London, Brussels, and Berlin. These include Igor Shuvalov, deputy prime minister; Arkady Dvorkovich, deputy prime minister; and Alexei Kudrin, ex-finance minister and aspiring prime minister. For Dvorkovich’s story, click. Disqualified from reappointment in a senior official capacity are ministers who own very large residences in London. 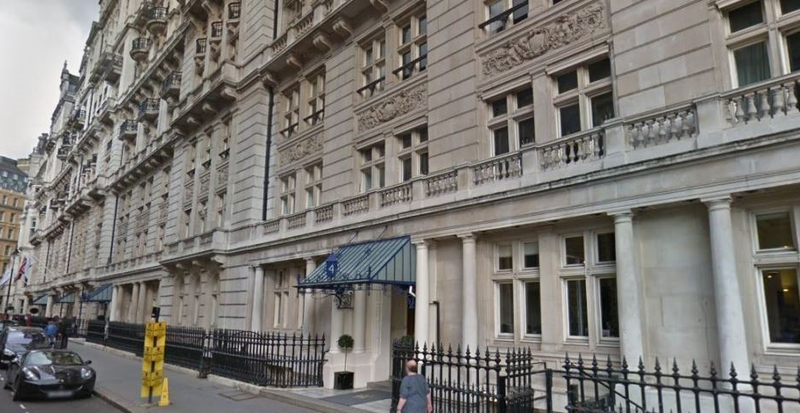 Shuvalov is the best-known of them, with two adjoining apartments at Whitehall Court, which he claims to have divested by selling them between offshore companies he also controls. Shuvalov’s front-door at 4, Whitehall Court, where he owns Flat 138A and Flat 138B.